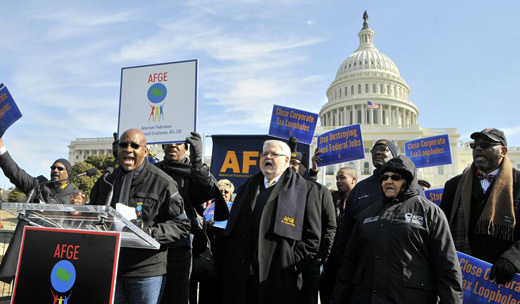 WASHINGTON (PAI) – Waving signs ranging from “America deserves a raise” to “Stop destroying good federal jobs,” hundreds of AFGE members marched on Capitol Hill on Feb. 11, campaigning for national and union causes. The parade, from the union’s legislative conference to the Capitol’s West Front, preceded worker lobbying. 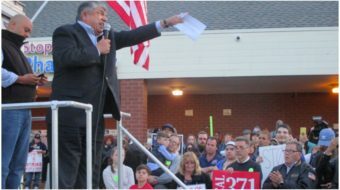 The 285,000-member union has a long list of issues — especially tax fairness (more taxes on the rich) — that it advocates to help the U.S. “get out of this swamp,” as AFGE President J. David Cox told the marchers. For the last several years, AFGE and other federal worker unions have been fending off GOP-inspired budget cuts that slash not just the programs the workers run, but their pay, in the form of increased pension contributions without future payments, coupled with a 3-year federal pay freeze. 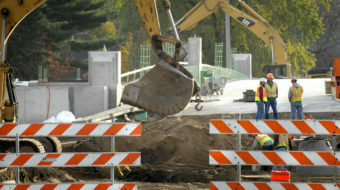 Now they plan to go on the offense, and the march and lobbying lawmakers is a part of that effort. 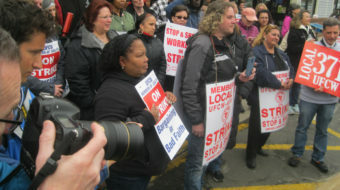 “We have a common struggle and a fight against privatization” of public services, added new Postal Workers President Mark Dimondstein, a guest speaker at the rally. National issues that unionists advocated included raising the minimum wage, paid family and parental leave, and tax fairness, such as a financial transfers tax on stock and other transactions, and elimination of so-called “carried interest.” That “lets hedge fund managers pay taxes at lower rates than their secretaries,” Cox says. Photo: “Rally for Shared Prosperity, Not Austerity,” AFGE Facebook page.